Gubbio is renowned for its exceptional richness of monuments and the fascination of its medieval appearance, which it has preserved, unaltered over the centuries. There’s an annual and traditional Eugubino folklore called the Corsa dei Ceri (Race of the Candles) (which has Mount Ingino, 827 metres in height, as its Meta; and where the Cathedral of Saint Ubaldo, patron of the City, is situated) as well as the Palio della balestra (archery competition). It was known in ancient times as Iguvium (then later Eugubium and Aggobbio). It is an important City of Umbria, in alliance with the Romans since the beginning of the 3rd Century BC. After the social war, it became a municipality and ascribed to the Crustumina clan for its fidelity. All its archaeological remains date back to Roman times. The Theatre, built around the middle of the 1st Century AD, contains two series of arcades. The so called Mausoleum is made up of a circular building on a square podium; in its interior, a room is covered with a barrel vault. The remains of the well know ancient Temple of Giove Appennino, have still not been identified. The City, impoverished during the high medieval times, mainly due to the wars between the Goths, Longobards and Byzantines, sent many men to the first crusades at the end of the 11th Century. It then became a more heavily populated Commune, firmly Guelph during the 13th Century. Various Guelph cities in Umbria and Tuscany were given to the Podestà and Captains of the populous (including to the Gabrielli from Florence). It was reclaimed by Albornoz as Church property around 1353. 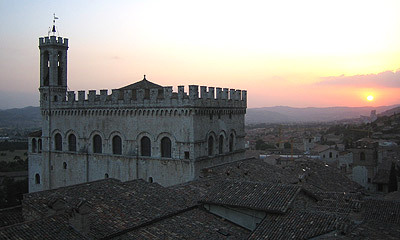 The city rebelled in 1376 and in 1384 and was then given over to Antonio di Montefeltro, noble of Urbino. In this way, it became part of the Duchy of Urbino until 1631 when it returned to property of the Papal State after the extinction of the Della Rovere, successors in 1508 of the Montefeltro Family. Its urbanistic look is characterized by a line of parallel roads on different and steep levels, which all lead to monumental buildings and dark stoned houses containing arched mullioned windows, window posts and ledges in a medieval style: overall giving an unmistakable look to the City. The existence of houses with medieval origins is characterized in the urban buildings of the small “Porta del Morto,” (Dead Door), with the threshold approximately 70 cm from the road level; maybe once used to allow entry and exit to coffins. Abbeys and churches from the Paleo-Christian and proto-Romanesque periods were destroyed by the Hungarians in 917. The oldest surviving monuments are the Church of San Giovanni Battista (St. John the Baptist) from the 11th Century, reconstructed in the 13th Century and gravely damaged by the 1997 earthquake, the Cathedral built at the beginning of the 13th Century and incorporating part of an ancient construction containing a single nave with a sloping roof, supported by squared stone slender pointed arches (a typical system of cover used in Eugubine churches), the Church of San Francesco, erected by Friar Bevignate of Perugia (1259-1292) on the spot where the Draper’s shop of the Spadalonga family was positioned, and with high naves, polygonal apses stressed by slender pilaster strips and beautiful unfinished facades.